Billed as the world's first practical jetpack, the device created by New Zealand inventor Glenn Martin is due to be unveiled today. Martin states that he has spent 27 years designing and perfecting his jetpack. It stands about five feet tall and its rotors are encased in two large ducts; a three-legged tripod holds it at rest when on the ground. A 200 horsepower gasoline engine provides power to the rotors. Okay, well, I guess I'm still waiting for my Gen-u-ine Heinlein jump harness, like the one in Stranger in a Strange Land (1961). Boone ordered "Fly up to the Sanctum office and tell the Warden on duty that I want another pilgrim's badge at the Sanctuary gate right away. The word is 'Mars.'" "'Mars,'" the kid repeated, threw Boone a Scout salute and made a sixty-foot leap over the crowd. Jill realized why the robe looked bulky; it concealed a jump harness. Martin's device is pretty cool, but then so is the Springtail EFV from Trek Aerospace, which looks almost exactly like Mr. Martin's jetpack. See a Springtail EFV video and see for yourself. 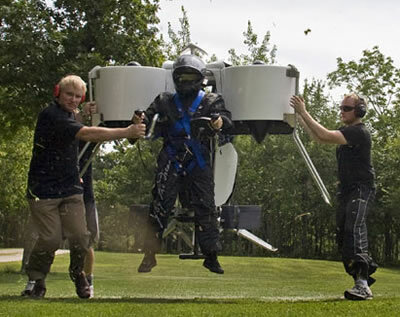 Also, don't miss the inverted VertiPod from Air Buoyant: the Segway of the Sky.